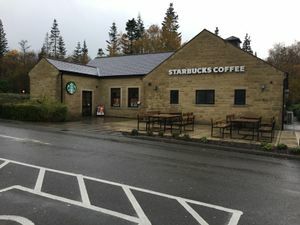 A pair of coffee shops in the woodland by the North Wales Expressway. There was a branch of Little Chef at Bodelwyddan, on the original route of the A55, which opened in the 1970s and closed when the new road opened in 1988. It's now Spice of India. The new Kinmel Park services opened at the same time as the new A55 in 1988. It was named after Kinmel Park Wood and had a pair of petrol stations and Little Chef restaurants. These both closed on 26 September 2012, and were later acquired by Euro Garages to become Starbucks. 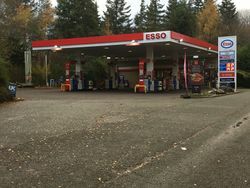 The eastbound Greggs store was added here in March 2019 and is situated in its own bespoke unit within the car park.